An MBA in Marketing and HR, my corporate career began in 2002. Since then I have held positions in Marketing with some of the renowned names in Financial Services and FMCG sectors. I am presently heading the Learning & Development vertical for a beverage major in Gurgaon. Personally, I am a fun-loving person who likes to lead life by the day. Meeting new people and traveling to new geographies is my passion and I am a keen sports enthusiast. While for most of my awake hours I am somewhat of an extrovert, there are times when I prefer my share of quiet and solitude as well. I have been an imaginative person for as long back as I can remember. Even as a child I would weave stories involving the world and the people surrounding me. However, these stories would usually remain within my head barring some arbitrary entries for publication in my school magazine. I have always been an avid reader and perhaps the stories I read were responsible for planting the bug of writing in my impressionable mind. However, my first published work (Pillars of Success, 2004) was more an outcome of circumstances than sheer intent. My job took me to a city that was previously alien to me. I had no family there and friends were hard to come by. Most people at work were elder and had a family to account for their weekends, but for me. Thus, it was the need to do something – preferably productive – with my time that got me down to penning my first manuscript. The rest, as they say, is history. The most challenging part about writing is the perseverance needed to complete a manuscript that one has started working on. Often when I am in the midst of a story, its characters and flow keep playing and refining themselves within my mind. And if for some reason – occupational demands or otherwise – this thread connecting me with the plot snaps, it becomes difficult to re-establish it. Hence, I try and ensure that I devote some time for writing at least 2-3 days in a week to avoid landing up with yet another incomplete manuscript on my hands. When I am not writing (or engrossed in office work) I try to spend some quality time with my family, especially my daughter, or I can be found in my bed cuddled up with an interesting read. In the next six months I don’t expect much to change with respect to my writing. I would probably have written a series of short stories for a Gurgaon based magazine and would probably be immersed in crafting my next novel. Over the next five years I hope to have diversified to other mediums – namely, television and digital media – to tell my stories. The material lies strewn all around us. Each day in our lives we meet characters and settings that are interesting in their own unique way. One simply needs to be more observant so as to be able to draw inspiration from them. Yes – don’t start writing with the premise of wanting to make it ‘big’. Writing is an art, and as artists it is our duty to approach our work with utmost sincerity and dedication. If you are able to achieve this, you will probably end up with a work that will talk for itself. A smile, a tear or an angry frown! A piece of writing which is able to elicit an emotional reaction from its readers can be said to have fulfilled its purpose. While English writing in India has picked up over the past few years, opening new doors of opportunities for aspiring authors, it has also had severe implications on the commercial aspects of writing. Absolute number of books bought by readers (or sold) has not increased in the same proportion as the number of new titles and authors being introduced. Consequently the same pie (commercially) is being split between many more claimants, making it increasingly difficult for new titles to reach out to a sizeable number of readers. Having said that, there are authors who, competition notwithstanding, are able to differentiate their works and garner a healthy readership base for their books. Hence, to my mind, an author must spend more time in shaping his work than worrying about ways and means to market it. A good book will eventually find its base of readers and rake in the moolah for its author whereas a run of the mill piece will forever struggle to achieve commercial viability. I try and look for motivation in the journey towards achieving a goal rather than the goal itself. Like, in case of writing, I enjoy the process of writing and that is what motivates me to keep going. At a more collective level, it is the smiles I am able to bring about on the faces of those who matter in my life that drives me. What has been your strategy for creating visibility to yourself and your writing? Unfortunately my day job does not permit me as much time as I would have liked for promoting my books. So, my actions in this regard are largely limited to organizing launch events, some basic PR initiatives and social media communication/ promotions. Beyond this I largely depend on my publishers for marketing my books, especially by way of blog reviews and participation in literary festivals and events. What was the most challenging moment in your writing content development process and why? The most challenging moment was when I was working with a renowned Bollywood director towards recreating the story of ‘The Legend of Amrapali’ in a celluloid friendly version. When there are two creative minds working on the same canvas, it can be difficult to find points of convergence on every matter under discussion. Also, as an author of the base story, it was not easy for me to let go of the plot twists or characters that I had so laboriously crafted. Everyone has a favourite / least favourite poet. Name yours and why? Every artist puts his heart and soul behind his works and thus it wouldn’t be fair for me to term any of them as my ‘least favourite’. However, my favourite poet would be Shri Harivansh Rai Bachchan. His collection of verses – Madhushala – captures the nuances of life in one of the most melodious forms that I have come across. Name some of the writers whom you look up to and why? P G Wodehouse – for his crisp sense of humour, Erle Stanley Gardner – for his sheer tenacity, Franz Kafka – for giving a whole new meaning to morbid hopelessness and Cartoonist Pran – for blessing a whole generation of Indian children with characters like Chacha Chaudhary, Billu and Pinki. Well, I would urge you to read the book and find out for yourself. 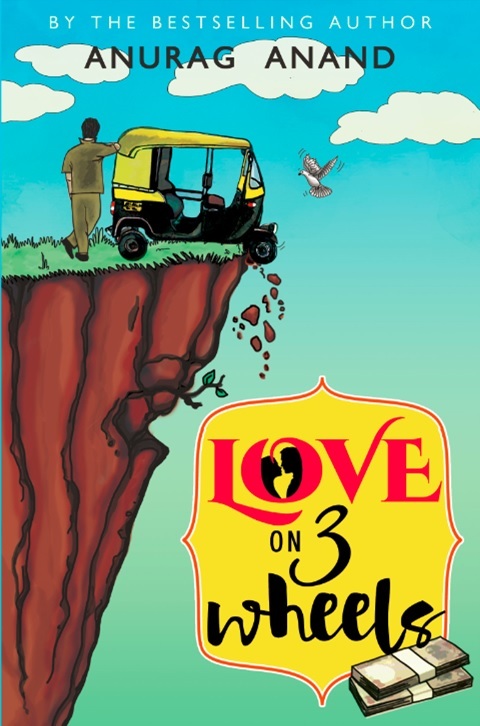 However, the one thing I can promise you is that the title (Love on 3 Wheels) has a definite connect with the story line. And if by any chance you are not able to figure it out, please feel free to reach out to me for a complete refund. Which genre do you feel gets the raw deal? Text books and poetry. Text books, because of all the hate they draw from those students who are forced to read them, and poetry because of its limited commercial reach. Many of us like reading meaningful couplets – and sharing them on our social media pages too – but when it comes to spending money behind a collection of the same, the numbers decline more sharply than the blade of a sword. Five adjectives that describe you? What book would you say has made the biggest impact good or bad on you? Atlas Shrugged by Ayn Rand. I had first read the book when I was still in middle school – it had taken me a long-long time to run through the thick pile of pages. It was this book that taught me the strength of characterization. As a rule I don’t read a book more than once and I haven’t read Atlas Shrugged again either, but its characters and their images remain fresh in my mind till this day. Do you get easily provoked by positive / negative comments? I would be lying if I said that I remain unaffected by the praise or criticism that my writing garners. A spurt of elation or a fit of fury, as the comments might warrant, is but natural. Only, I have been consciously trying to mellow down my reactions and keep away from extremities. Do you plan to write more books, as every author dream it is? Of course, I will continue to write for as long as I enjoy writing. Are you a judgmental person, do you prefer to take sides instead of standing neutral? I am instinctively an aggressive person. Thus, my hard wiring is towards clearly aligning myself with one of the warring factions in case of a conflict. However, with time I have begun to realize the futility of it and instead I now try and look at things from a more neutral viewpoint. Perhaps that’s what they call maturity. What genre attracts you the most and which genre you avoid? I love reading crime fiction. However, when it comes to self-help genre I tend to get pretty selective about what I read. Your Views on increasing plagiarism? Plagiarism has always existed and I can’t state with certainty if it has increased in the recent past. It is an evil and there’s no debating that. Only, there is a long way to go before we have adequate systems and processes in place to curb it completely. Till then, each one to his own, I guess.